Get the plugin here, then right click an image or folder and select "Set crop focus" and take it from there. Here's how the plugin looks in action. Just use the mouse to position the crop focus. Note: The plugin lets you preview the cropped region using a couple of sample shapes but it doesn't let you set the crop shape. This is usually controlled by the skin. We encourage you who are Java developers to contribute with smart plugins for jAlbum. Our plugin API is documented here and you can get the full source for the CropFocus plugin at GoogleCode . CropFocus is licensed under the liberal Apache 2.0 license. But no worries - this will be only a one time thing for me - I´m not likely to change the crop focus frequently. The time that saves me does way more than compensate that minor "new" flaw. I would propose to get that functionality included in future versions of jAlbum - it is really great. @Macsass, thanks for your positive feedback! It's great to hear what a time saver this is for you. We're modifying the "date changed" date even though the original image isn't touched in order to trigger jAlbum to reprocess the generated image. Let Turtle base its "New" flag on "Date added" to avoid this problem. just noticed a minor issue with the plugin: After changing the crop photo for a photo Turtle recognizes the picture as "new". Obviously something changes for the picture itself, so Turle regognizes it is "new"? I have Turtle set to look at the "file changed" flag. Not sure if this is a turtle issue or an issue of the plug-in. As I can´t see the plugin touching the original files, I would guess it might be a turtle issue. Still - this plugin is great help for me ... thanks again! This is great - you won´t believe how much time that saves me! Until now I have manually cropped each picture to the desired frame and had to copy those to the final generated album - having to redo that for any change I have made. This plugin would have been the very top of my wishlist! This is a very big help. Thank you. 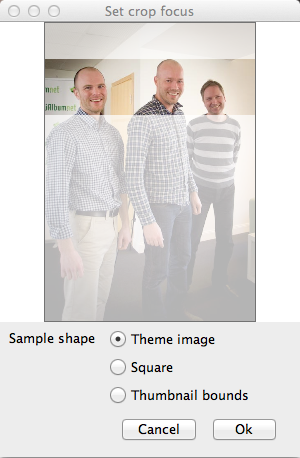 The result is still approximate, though, especially if the theme image does not have the default dimensions. Can the crop focus extension be made to adapt to this?